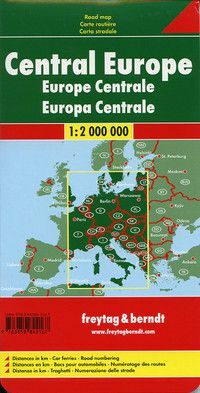 A detailed, folded road map covering Central Europe from the eastern two-thirds of France(including Paris) to Poland and Albania, and from southern Sweden in the north to the northern coast of Africa to the south. Printed on one side this map shows road information such as the autobahn to minor roads and their road numbers. Distances between cities are labelled in kilometers. Unfolds to 48"x34". Scale = 1:2,000,000 or 1"= 80 miles.